Power Output: 150 watts minimum rms per channel, both channels driven into 8 ohms from 20 Hz to 20 kHz, with less than 0.05 percent THD. Power Bandwidth: From 5 Hz to 110 kHz at less than 0.1 percent THD into 8 ohms, both channels driven simultaneously at 75 watts per channel. One-Watt Frequency Response: 0.5 Hz to 120 kHz with less than 0.2 percent THD. Square Wave Rise Time: Better than 3 sec. Phase Shift: Less than 0.5 degrees at 20 Hz; less than 12 degrees at 20 kHz. Slew Rate: Greater than 30 V per sec. Total Harmonic Distortion: Less than 0.05 percent from 1 watt to 150 watts rms, both channels driven simultaneously into 8 ohms from 0.5 Hz to 20 kHz. IM: Less than 0.05 percent from 0.015 watts to 150 watts. Hum and Noise: Better than 100 dB below 150 watts. Damping Factor: Greater than 300 to 1. Input Sensitivity: 1.25 V for 150 watts. Dimensions: 9 1/4 in. (23.5 cm) H by 19 in. (48.3 cm) by 14 in. (35.6 cm) D.
Weight: 55 lbs. (24.9 kg). 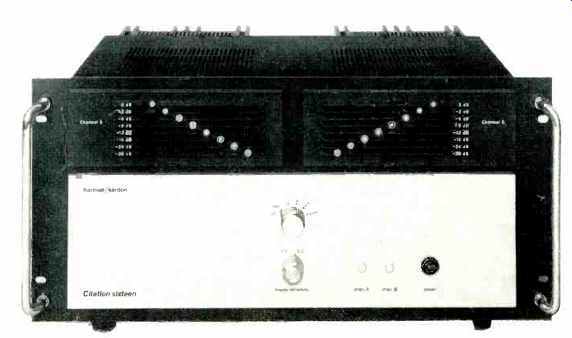 Harman/Kardon's Citation 16 is a basic, 150 watt per channel power amplifier with an appearance rather different from most other power amplifiers in that it has a logarithmic-based LED output amplitude display, instead of the usual analog meters. This amplifier has large wire handles for ease of handling, and it can be rack mounted. Construction is in the form of a basic chassis with a front and back panel attached. Fore and aft side-angle pieces connect the front and back panels to the chassis and lend mechanical rigidity to the structure. A cover enclosing top and side ties the tops of the front and rear panels to the chassis, resulting in a package with excellent mechanical integrity. Mounted on the main chassis are two power transformers, four 10,000 uF/85V filter capacitors, and two primary voltage selector plug arrangements. Underneath the main chassis are the main power rectifiers and the rectifier and filter capacitors for the LED circuits. 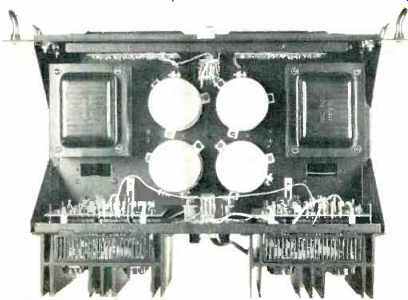 On the outside of the rear panel are two large heat sinks, two signal input (RCA jack) connectors, two sets of five-way binding post output connectors, two primary a.c. line fuses, and the a.c. line cord. On the inside of the rear panel and behind the heat sinks are the two main amplifier circuit boards. Mounted between the circuit boards are the output buffer inductors. Front panel features consist of the two LED output level displays, two knobs for controlling display sensitivity, two power-on indicators, and the primary power switch. Referring to the schematic diagrams in Figs. 1 and 2, the input stage of the Citation 16 is half of a µa739 op-amp operated with a supply voltage of ±10 V. Next is a complementary pair of transistors, Q, and Q2, operated in common-emitter mode, with their bases tied together and driven from the output of the op-amp. Current in these transistors is set by their emitter resistors and is about 1 mA. The outputs of Q1 and Q2 are direct-coupled to Q5 and Q6 which form a complementary pre-driver for the output stage. Quiescent current in this stage is about 9 mA. The advantage of a fully complementary pre-driver is that it can drive the output in a symmetrical manner, providing equal drive ability in either the plus or minus direction. Connected between the collectors of Q5, and Q6 is the bias network with the bias regulator transistor, Q16, mounted on the output stage heat sink. Output stage configuration of the Citation 16 is a quasi complimentary one and of a form used by a number of other manufacturers. The usual operation of such a stage is to have the output devices completely cut off under idling conditions and for the drivers to be conducting some 30 to 100 mA. In this particular design, each output device is conducting about 20 mA at idle, resulting in an output stage total quiescent current of about 80 mA. This mode of operation has the potential advantage of eliminating two discontinuities per half cycle when cutoff output devices would come into and out of conduction. Volt-amp limiting is of the usual form that shunts away base drive to the output stage when dissipation is considered to be excessive. In the LED display circuit, the output signal of the amplifier is first passed through a voltage divider that produces a reference full-scale voltage for amplifier output powers of 4, 16, 64, and 160 watts average equivalent for a sine wave. A resistor at the top of this divider is shorted or not shorted for these power levels for 4 or 8 ohms. The input to the LED circuit picks up one of the four outputs of this divider, +12 V for full scale test or an open circuit to disable the display. Table I-Output noise and signal-to-noise ratio vs. measurement bandwidth. The Citation 16 has a separate power supply for each channel. Main power amp supply voltage is ±60V. A separate rectifier and filter system provides unregulated ±12V for the LED indicator circuitry. Listening tests on the Citation 16 were done with Dahlquist DQ-10s and Magnepans, both on loan from the manufacturer, Stax SRX MK3 electrostatic phones, and a pair of Tannoy Gold 12s in a friend's system. Pickups used were an EMT XSD-15 and a Fidelity Research FR-1 MK2. Preamps used included a Dyna PAS-3 with one of the reviewer's FET pre-preamps for the FR-1 MK2 and several of the reviewer's new solid-state designs, along with a GAS Thaedra. Fig. 2: Circuitry of LED display. The general consensus of the reviewer and a number of other highly critical listeners was that the Citation 16 had excellent, very tight, and very powerful bass response, and good mid and high end definition, though it sounded more two dimensional spatially with more graininess and edginess than the very best solid-state amplifiers reviewed so far. The LED output level display functioned very well and was judged to be a most useful tool for determining how much amplifier excursion was being used. The Citation 16 was run for one hour with a 1-kHz test signal driving both channels to one third of rated power (i.e. 50 watts) into 8-ohm loads. Heat sink temperature at the end of the hour was hot, as expected, but not excessively so. Voltage gain was measured and found to be 27.5X or 28.8 dB for both channels. Input voltage for rated output into 8 ohms is therefore 34.64/27.5 or 1.26 V. Harmonic distortion at 1 kHz and IM distortion as a function of output power into 8-ohm loads are shown in Fig. 3. Figure 4 has THD plotted vs. frequency and power, along the one-watt frequency response. The Citation 16, as can be seen in Fig. 4, has excellent low frequency response and is one of three amps reviewed so far that has such extended low frequency response. Scope pictures of amplifier response with various test signals and loads are shown in Figs. 5-8. The top trace of Fig. 5 is for a 10-kHz, 10 V p-p square wave into a load of 2 ohms in series with 2µF. 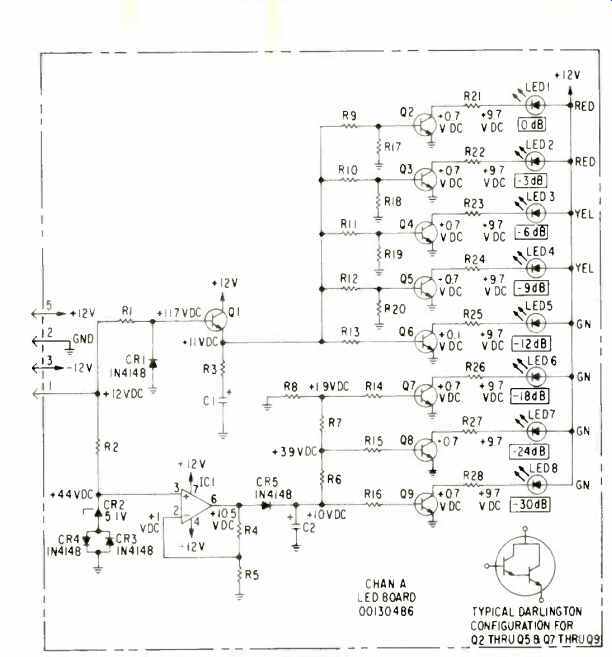 The bottom trace of this figure is for a 50 Hz, 80 V p-p (200 watt) square wave into 8-ohms. Note the low amount of tilt in this waveform indicating the amp's excellent low frequency response. In Fig. 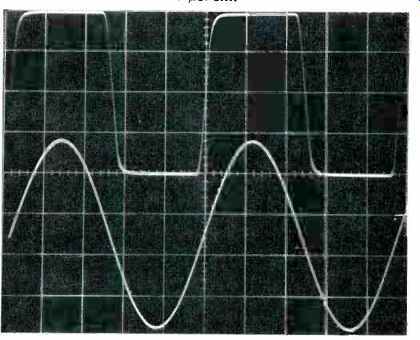 6, response for a 10 V p-p, 10-kHz square wave is shown for 8-ohm loads (top trace) and 2-µF loads (bottom trace). The top trace of Fig. 7 is for an 80 V p-p, 20-kHz square wave into 8-ohm loads. Recovery from slewing is very smooth although not quite as rapid (i.e. with sharp corners) as a few other amps reviewed. Measured slew rate from this trace is about 27 V/µS. Harman Kardon drives the amplifier to some 100 V/µS for this test and comes up with 30 V/µS for their spec. Under this measurement condition, the measured slew rate was 30.8 and 36.4 V/µS for the left and the right channels, respectively. 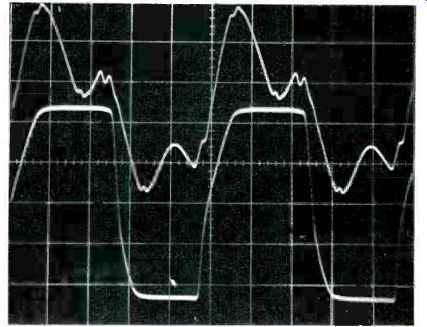 A 150 VA, 20 kHz sine wave into 1 µF is shown in the bottom trace of Fig. 7. THD was about 0.08% under these conditions, which is excellent. Figure 8, top trace, is an attempt to drive a 20 kHz square wave into 1 uF. Behavior is reasonable up to about 40 V p-p and then the output starts to become asymmetrical as shown. Output VI limiting is probably the cause. The bottom trace of Fig. 8 is for a 20 kHz sine wave into 8-ohm loads with a 2 dB input overdrive beyond the onset of visual output clipping. Not evident in the trace is the fact that the peak amplitude has dropped some 8 to 10 percent from the just-clipping value, indicating some considerable common mode conduction in the output stage under these conditions. Damping factor was measured for both channels, and, as usual, one channel has a higher damping factor than the other. The left channel was about 425 at low frequencies, decreasing to 290 at 1 kHz and to 22 at 20 kHz. The right channel was around 750 at low frequencies, 450 at 1 kHz, and 25 at 20 kHz. Possible causes include slightly different wire lengths from amp outputs to speaker terminals and variable series resistance of any element between the output of the board and the speaker terminals themselves, such as relays terminal cutouts, and push-on connectors. Output noise with shorted inputs and signal-to-noise ratio as a function of measurement bandwidth appears in Table I. The noise was composed of random components plus some higher order harmonics of 60 Hz in the form of pulses every 9.3 mS. Fig. 3: Distortion vs. power output. Fig. 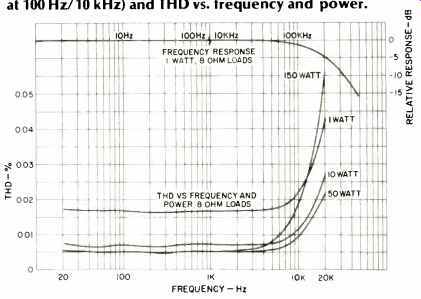 4: One-watt frequency response (note break at 100 Hz/10 kHz) and THD vs. frequency and power. Fig. 5: Top trace, 10-kHz square wave into 2 ohms in series with 24 F, scales are 5 V/cm and 20 4S/cm; bottom trace, 50-Hz, 200-watt square wave into 8 ohms, scales are 20 V/cm and 5 mS/cm. Fig. 6: 10-kHz square waves into 8 ohms, top trace, and 2 µF, bottom trace. Scales for both are 5 V/cm and 20 4S/cm. Fig. 7: Top trace, 20-kHz square wave into 8 ohms. Bottom trace, 20-kHz sine wave into 1 µF. Scales for both are 20 V/cm and 10 µS/cm. Fig. 8 Top trace, 20-kHz square wave into 1 µF. Bottom trace, 20-kHz sine wave into 8 ohms with about 2 dB overdrive. Scales for both are 20 V/cm and 10 µS/cm. Table II: LED indicator on and off points vs. output level. 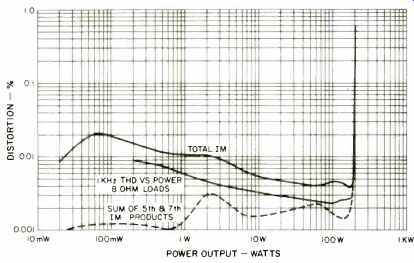 Power output at the onset of visual clipping was found to be 289.0, 190.1, and 110.3 watts for 4-, 8-, and 16-ohms, respectively, for a 1-kHz test signal. Not shown in any of the photos is a reverse spike that occurs on these 1-kHz clipping waveforms. At the end of the clipped portion of the waveform, the amplifier "sticks" or holds on longer than it should, and during the stick time, a narrow spike of considerable magnitude appears going towards the zero axis. This happens for both plus and minus half cycles and for loads ranging from 4 to 16 ohms. The cause of this is probably, again, some action of the protection circuit. (Editor's Note: Harman/Kardon believes that the spike is a function of the IC driver, rather than the protection circuit, since the spike still exists when the protection circuitry is disconnected.) The LED display system was checked for accuracy with a precision dB attenuator feeding the input of the amplifier. The 0 dB point was set for 34.6 volts at the amplifier output. The LED on and off point was measured in terms of dB down from 0 to the nearest dB. Results are in Table II. Attenuation accuracy of the four position range attenuator and the 4/8 ohm switch was found to be satisfactory. Summing up, the Harman/Kardon Citation 16 is a well-built amplifier that should prove to be reliable in use. This amp should have particular appeal to those whose passion is tight, clean bass response in a high power unit. The flashing LED power output display is a quite modern level indication system which should also attract potential purchasers.